How do you know which dining table shape is right for you? There is more to it than preferring one shape over the other. Not that your preference for one shape over another does not matter, but there are a couple of other things to keep in mind. The two main factors that should determine the shape of your dining room table should be the shape and size of your dining room or dining area and the number of people you usually seat around your dining table. You will find that certain shapes lend themselves better to certain conditions. When you match the two, you create a flow that makes your space look and function better. A rectangular dining table shape is perhaps the most common, and there is a pretty good reason for it. Most dining rooms are also rectangular. Also, a rectangular dining table is also a good shape to seat more than four people, especially if it comes with an extra leaf for extending the length, should you need to seat additional guests. Ideally, a rectangular table should be between 36 inches to 42 inches wide. Narrower rectangles can work well in a narrow room, but if the table is any narrower than 36 inches, you may find it difficult to fit place settings on both sides and enough room for food on the table. If you do prefer to have a narrow table, you might want to consider placing the food on a sideboard or buffet table, so guests can help themselves before sitting down. Square shaped rooms look best with a square dining table. Square dining tables are also a good solution if you do not have a large group to seat most of the time. A square table that can be expanded with leaves is good for those times you will need to seat more guests. Also, two square tables can be grouped together to create a larger rectangular seating arrangement for special occasions. A benefit to having square tables is that they provide intimacy and a satisfying solution to seating a small number of people. It can be off-putting to have large a rectangular table if there are only two or three people present for most of your meals—a larger table can make the space seem cold. The square table is not the only solution for a smaller or square-shaped room. A round dining table is another possibility, and it is one of the best shapes for small gatherings since everyone can see everyone else, conversations are easier to carry on, and the setting feels cozier and more intimate. 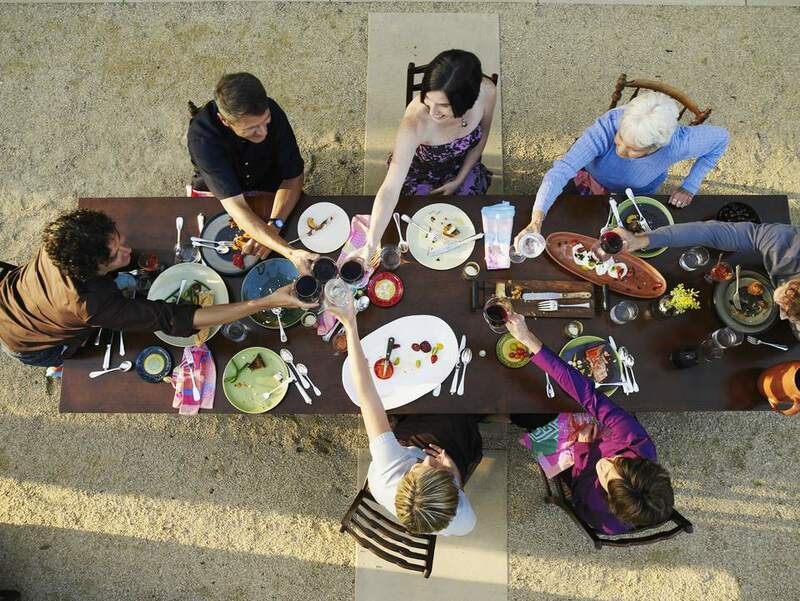 Keep in mind that a round table is not ideal for larger gatherings. A large round table means that, while you can still see others, they seem far away, and you may have to shout across the table to be heard. Besides, most dining rooms are not large enough to accommodate large round dining tables. If you do prefer a round table over a rectangular one and you think you may need to seat a larger number of people from time to time, consider getting a round table with an extension leaf. That way, you can use your round table most of the time but extend it when you have company over. An oval dining table is very similar to a rectangular one in almost all its attributes. Visually, it seems to occupy less space than a rectangle because of the rounded corners, but this also means that it has less surface area. You might want to consider an oval table if you have a narrower or smaller room and might occasionally need to seat more people.